The world No. 1 ranked golfer shot a 3-over 74 at The Barclays in the FedEx Cup playoffs. PARAMUS, N.J. (AP) — Bo Van Pelt had just the round he needed to start the FedEx Cup playoffs. Rory McIlroy could afford an off day, and he finally had one. With no guarantee of playing beyond this week, Van Pelt combined a great start and a great finish for a 6-under 65 to take a one-shot lead Thursday at The Barclays. He is No. 104 in the FedEx Cup. Only the top 100 advance to the next tournament. McIlroy is the top seed after his amazing summer of winning two majors and a World Golf Championship. But the world’s No. 1 player showed the effects of taking a week off to celebrate. He had a 3-over 74, his worst start to a tournament in two months. 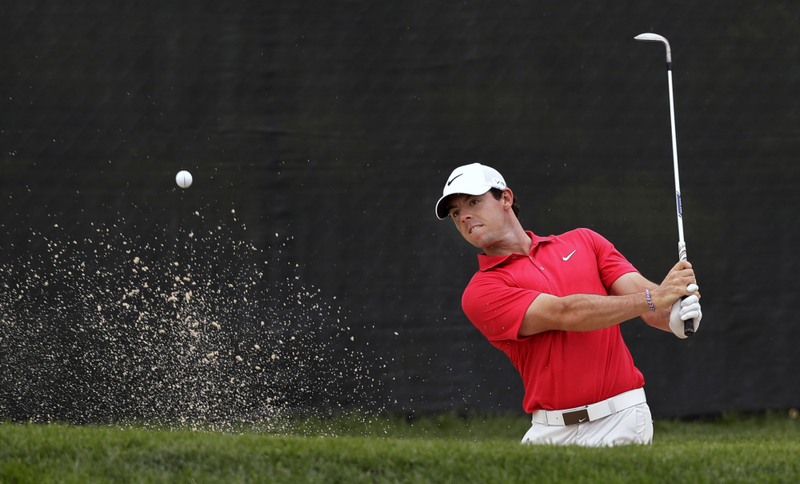 McIlroy established himself anew as golf’s No. 1 player with a wire-to-wire win at the British Open, a come-from-behind win at a World Golf Championship and a late charge at Valhalla to win the PGA Championship and become the third-youngest player with four majors. “I wanted to enjoy it for a week,” he said. Hunter Mahan, the only player to have competed in all 29 playoff events since the FedEx Cup began in 2007, got off to the start he needed to extend that streak by at least a few more events. At No. 62 in the standings, he opened with a 5-under 66 and shared the early lead with Cameron Tringale and Charles Howell III. Howell was on the opposite end of McIlroy. He had missed his last two cuts, so to open with three straight birdies was enough to wipe away some sour memories and get back to just playing. Howell made seven birdies on a course that allowed scoring with soft greens, and punished errant tee shots with its thick rough. Ryo Ishikawa and Russell Knox opened with 67. Phil Mickelson had a 71. McIlroy started out fine with a few reasonable birdie chances that he didn’t convert on a couple of tough holes on the back nine. But from the right rough on No. 12, he came up short in a bunker, blasted that out into thick collar around the green and hit a flop shot out of the deep grass to 15 feet, missing the putt and taking double bogey. On the par-5 13th hole, he laid up into the rough from a fairway bunker, caught a flyer and sailed over the green into a back bunker for another bogey. He went out in 40 by clipping a tree on the 18th hole and missing a 6-foot par putt. McIlroy at least picked up a few birdies on the front, driving into a bunker on the “five-and-dime” fifth hole that plays 288 yards and getting up-and-down for birdie. He finished with a 30-foot birdie putt on the ninth hole. His 74 ended a streak of 14 straight rounds under par – the last eight in the 60s – and was his highest start to a tournament since he opened with a 74 in the Irish Open and missed the cut. “It’s not a bad thing,” he said. “A score like this would be tougher to take if I had not just come off the weeks that I had. But at the same time, I want to play well and I want to give myself chances to win tournaments. Mahan opened with a 62 when he first played Ridgewood in 2008. He didn’t break par the rest of the week and tied for 31st. This was a good time to start well. Along with trying to get to East Lake for the Tour Championship for the eighth straight year, he still has two weeks to audition for U.S. captain Tom Watson for one of three wild-card picks for the Ryder Cup.